Key to the honey bee health is nutrition! Us humans can weather many diseases if we practice good nutrition. Same goes for the bees. Honey bee nutrition comes from two sources – pollen and nectar. Feed 2:1 sugar syrup (that’s thick!) this time of year. You want them to store it. In spring, we feed 1:1 to stimulate the queen, toward the end of July the hive begins to prep for winter. The colony should weigh between 90 – 120 pounds going into winter. Feed protein substitute patties along with heavy syrup. Randy Oliver, Scientific Beekeeping states, “Practical application: don’t ask what you “should” do—learn to read the combs yourself. The bees will tell you!”. 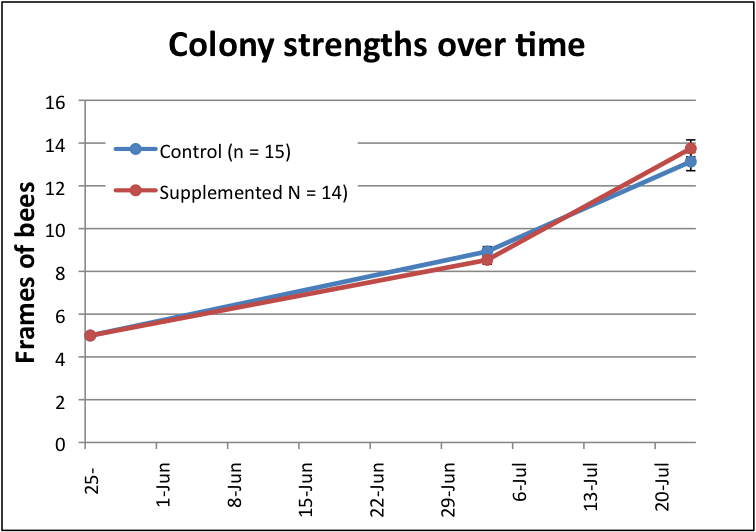 Are the colonies rearing open brood (larvae) in earnest? During protein shortage the nurses will cannibalize eggs and young larvae. Do the larvae have a high rate of survival to pupation, as indicated by solid patterns of even-aged larvae making it to pupation (capping). Incomplete nutrition will result in poor larval survival or disease. Practical application: just because there is beebread around the brood, that does not necessarily mean that the colony is enjoying good nutritional intake. An excellent practice is lifting the hive from the bottom box’s back to fixate the weight in your mind. Do this once a week during September/October. When you lift from the back, it should be so heavy that you can hardly get the back off the ground. You should organize the frames for winter now. Remember, the winter cluster will move UP (Langstroth) as they progress through the winter. The below paragraphs apply to Langstroth. With Top Bar and Long Hives the brood moves from one side to the other (if brood is on the left it moves to the right). Arrange the frames in such a manner to have brood on one side with full frames of honey following. Any partial frames should be at the end of the line. Middle frames should be brood. 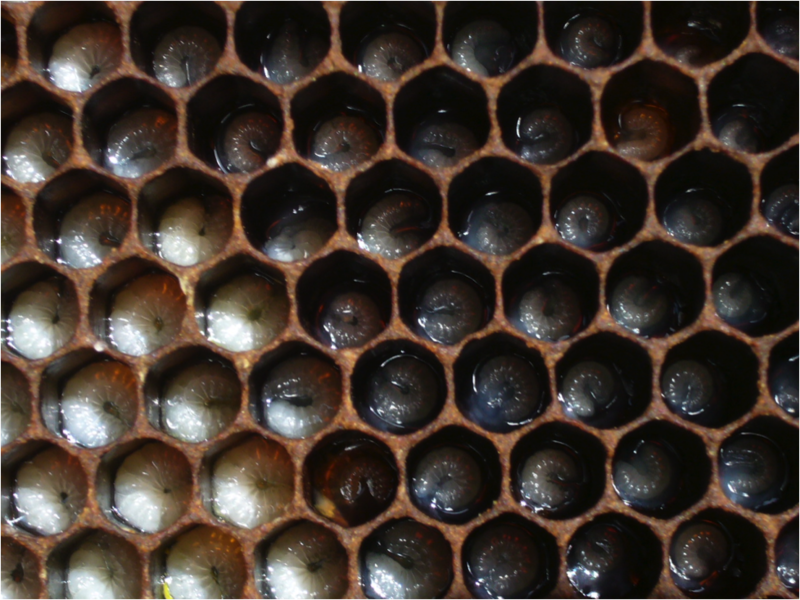 Place pollen frames on either side of the brood area. This should be all honey by fall. You may put some brood up there now (in the middle) but be sure the upper corners are stuffed with honey. Feed, feed, feed if you don’t see honey in the corners. Don’t worry about the bees needing space! I am frequently asked if honey supers should stay on because the bees need room. The hive begins to down size its population in the latter part of July. You want this colony stuffed with bees and honey! “Bearding” on hot days is totally normal. Consider an entrance reducer made of wire fabric to allow ventilation while assisting the Guard Worker Bees in their duties. When you rearrange, please make your visit brief. It’s robbing season (July – September Oregon), so the longer your colony is open, the more robbers and yellow jackets will seek the open buffet. How are your mite counts? Have you treated? It’s HOT! And fire danger is HIGH! Remember in the Northwest United States fire season is from July through September. If you are visiting your bees this weekend, please take extra precautions with your smoker. Don’t set your property on fire and don’t get your picture on the front page of the newspaper as the beekeeper that started a grass fire! Never put your smoker in the dry grass or weeds. Place on a rock, in gravel, or better yet, a metal bucket. Place a layer of green grass or leaves above your burning fuel in the smoker can. This will prevent sparks from exiting the smoker. Extinguish your smoker when you are finished. Do not dump burning fuel on the ground—even if you stamp it out! Work with a buddy and a cell phone and don’t hesitate to call 911 in the event of a fire. Keep a close eye on those mites—maybe check again in a few weeks. I have seen mite loads jump quite dramatically this time of year. Remember, mites are peaking while the bee population is decreasing. In other words: we have more mites on fewer bees right now!